With Punjab raising Value Added Tax (VAT) on wheat purchase from 4 per cent to 5 per cent, private traders have decided to go to Uttar Pradesh and Rajasthan to purchase wheat. Global luxury carmakers are lining up to grab a share of the market in India. After the recent launch of Swedish super luxury sports car Koenigsegg and the Italian luxury sports car maker Maserati. World trade will grow 6.5 per cent this year, the World Trade Organization said on Thursday, above the average rate between 1990 and 2008 of 6 per cent, but falling short of last year's dramatic rebound.The WTO said growth in merchandise trade in 2010 as measured by volume of exports was 14.5 per cent, revised up from its previous forecast of 13.5 per cent. Food inflation fell to a four-month low of 9.18 per cent for the week ended March 26, prompting experts to suggest that the numbers are likely to stay stable. The Board for Reconstruction of Public Sector Enterprises (BRPSE) has recommended that telecom equipment manufacturer ITI should be merged with the two state-run telecom companies BSNL and MTNL. The National Bank for Agriculture and Rural Development (NABARD) increased its assistance to Punjab and Haryana substantially last fiscal. Assistance to Punjab touched a new high of Rs 5,690.16 crore in 2010-11, 24 per cent more than the support provided in 2009-10. To Haryana, the bank provided support of Rs 3,834 crore for agriculture and rural development in 2010-11. The Finance Ministry today said it is holding consultations with the RBI and will approve the draft guidelines for granting new banking licences within 15 to 20 days. The number of mobile users in the country has risen to 791.38 million in February with the addition of 20.2 million connections. The Telecom Regulatory Authority of India (TRAI) has stated that the wireless user base grew 2.62 per cent. The total tax paid by a private trader in the state works out to 14.5 per cent, which includes 5 per cent VAT, 2 per cent as market fee, 2 per cent as rural development fund, 3 per cent cess and 2.5 per cent commission to the commission agents. Flour millers are exempt from paying market fee as well as rural development fund. So, while private traders have to pay 14.5 per cent as tax in order to buy wheat from Punjab (and 10.5 per cent for flour mill owners), they can actually get wheat by paying just 4.6 per cent tax over the minimum support price (MSP) in Rajasthan. Even in Uttar Pradesh, private traders have to pay just 8 per cent tax over the MSP in order to buy wheat. Rajasthan recently said that all private buyers were exempt from paying taxes on buying wheat from its mandis. This has ensured that all private players , including agri corporates, will now be going there to buy wheat. Naresh Ghai, president, Punjab Roller Flour Mills Association, said, “Why will we purchase the food grain from here. As it is, private traders have to buy wheat at a higher rate than the MSP. We have to pay Rs 175 per quintal over and above the rate at which we purchase wheat. In states like Uttar Pradesh, one can actually get the same quality wheat at prices lower than the MSP. If Punjab has to encourage private purchasers, then it will have to rationalise taxes on wheat,” he said. Sources said traditionally Punjab has always had a high tax on wheat purchase. This is one of the reasons that the share of private traders in total wheat procurement has been negligible. When agri corporates entered the Indian market for wheat procurement, they has flocked to Punjab for getting good quality wheat. However, with quality being almost similar in Uttar Pradesh and Rajasthan, and with these states offering the produce at much lower rate, the private players are going there. Global luxury carmakers are lining up to grab a share of the market in India. 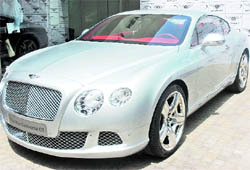 After the recent launch of Swedish super luxury sports car Koenigsegg and the Italian luxury sports car maker Maserati bringing its range of cars yesterday, British car-maker Bentley today introduced its Continental GT luxury sedan in India at a price tag of Rs 1.9 crore (ex-showroom, Delhi). Bentley Regional Director (India) Chris Buxton said, “India is growing fast in the luxury automobile space. We hope to sell 100 units here from our entire range by next year.” Based in Crewe, England, the company expects to sell 45 units in India in this year. Globally, it plans to sell 7,000 units in 2011. Maserati, which sold 5,675 cars globally in 2010, expects to sell 100 units in India in three years. Buxton said the Indian super luxury car market is estimated to be around 600-700 units this year and it is growing at around 30 per cent every year. However, Maserati was of the view that the luxury car market in India grew about 70 per cent last year. “Bentley’s sales in India are growing at around 45 per cent every year,” he added. The Volkswagen Group company’s new 2-door offering, the Continental GT, is powered by a 12-cylinder engine and can reach a top speed of 318 km an hour. World trade will grow 6.5 per cent this year, the World Trade Organization said on Thursday, above the average rate between 1990 and 2008 of 6 per cent, but falling short of last year's dramatic rebound.The WTO said growth in merchandise trade in 2010 as measured by volume of exports was 14.5 per cent, revised up from its previous forecast of 13.5 per cent. Developing country' trade as measured by exports growth is projected to grow 9.5 per cent, while that of developed countries is set to grow only 4.5 per cent, the WTO said. The Japan earthquake and nuclear accident have been factored into the prediction, but these twin disasters together with volatile commodity prices and turmoil in West Asia make predictions particularly uncertain this year and the risk is to the downside, it said. WTO director-general Pascal Lamy sought to present the figures as evidence of "how trade has helped the world escape recession in 2010". 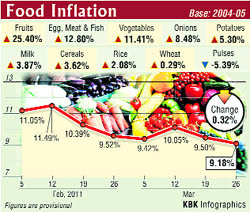 Food inflation fell from 9.50 per cent in the previous week and 21.15 per cent a year ago. The rate of price rise during the week ended March 26 was the lowest since the week ending November 27, 2010, when it was recorded at 8.69 per cent. Although good crop production will keep food inflation low, experts fear that spiralling prices of crude oil in the international market could cast a shadow on the overall price situation. The prices of pulses declined 5.39 per cent during the reporting week, while other food items like rice, wheat and milk recorded modest increases. Items like fruits and vegetables, however, continued to remain dear. “With a record output projected for this year, we believe food inflation will remain moderate in the next few months,” Crisil Chief Economist D K Joshi said. The government had yesterday said that India’s food grain production is estimated at a record 235.88 million tonnes in the 2010-11 crop year, ending June, on the back of the highest-ever output of wheat and pulses. "While prices of vegetables and fruits would continue to display some volatility, reflecting their perishable nature, prices of cereals and pulses may show a mild decline in the coming weeks. Overall, a favourable base effect is expected to aid a decline in food inflation in the coming weeks," ICRA Economist Aditi Nayar said. Food inflation was in double digits for most of the last fiscal. However, it has shown signs of slight moderation since the last week of February and this is the second consecutive week when it was a single-digit figure. The panel said BSNL could claim tax breaks if it merges with a loss-making ITI and suggested BSNL can also merge MTNL with itself. “There is no reason for MTNL to continue as a separate entity,” the note adds. The proposal comes at a time when all three companies are facing fierce competition from private telecom operators and causing huge losses to the exchequer. ITI, a state-owned telecommunication equipment maker, has struggled to keep pace with the growing needs of the sector. The BRPSE has been constituted to advise financially troubled state-run companies. MTNL posted a net loss of Rs 2,611 crore on revenue of Rs 3,781 crore during the financial year ended March 31, 2010. ITI posted a net loss of Rs 459 crore on revenue of Rs 4,596 crore during the same period. BSNL expects to turn profitable only in 2013. The company expects to post a net loss of Rs 2,725 crore on revenue of Rs 31,738 crore in the fiscal year ended March 31, 2011. The loss is expected to narrow to Rs 623 crore on revenue of Rs 36,569 crore this fiscal. S C Kaushik, chief general manager, NABARD, said that here had been 24.37 per cent increase in financial assistance (refinance and loan) to Punjab for bringing about sustainable development of agriculture, allied activities and strengthening rural infrastructure. NABARD extended credit for crop loans to the tune of Rs 4,275 crore to Punjab State Cooperative Bank and three regional rural banks last fiscal. Under the RIDF scheme, NABARD sanctioned a loan of Rs 602.02 crore to the Punjab government last fiscal for 170 projects, taking the cumulative sanction to Rs 4,614.36 crore. For Haryana, 74 per cent (Rs 2,855 crore) of the total support was provided to cooperative banks and regional rural banks for short term credit needs of farmers, 20 per cent (Rs 775 crore) was provided towards investment credit, and Rs 204 crore was disbursed to Haryana for rural infrastructure development. The Finance Ministry and RBI officials are discussing the draft guidelines on a "day-to-day" basis, Financial Services Secretary Shashikant Sharma said. "Very soon, we will have a final discussion (with the Finance Minister on the draft) and then we can go ahead and give a green signal to it," he said. Comments of stakeholders will be invited on the draft before the final guidelines are notified. In the Budget 2011-12, Mukherjee had said the RBI plans to issue guidelines for the grant of new banking licences by March 31, 2011. Meanwhile, sources said the Finance Ministry may finalise the guidelines even before proposed amendments to banking laws aimed at giving more powers to the RBI come into effect. The Banking Laws (Amendment) Bill, 2011, was introduced in the Lok Sabha during the Budget Session, which seeks to give voting rights to investors commensurate with their shareholding in the private sector banks. However, of the total 791.38 million, only 562.98 million subscribers were active subscribers on the date of peak visitor location register (VLR), the report adds. The total number of telephone subscribers in the country is now 826.25 million. Overall teledensity in India reached 69.29. Vodafone led the additions pack with 3.56 million users. Reliance Communications followed next with an addition of added 3.3 million new subscribers. Bharti Airtel added 3.2 million subscribers.